The Pride of Gola, Gola Island, Donegal. 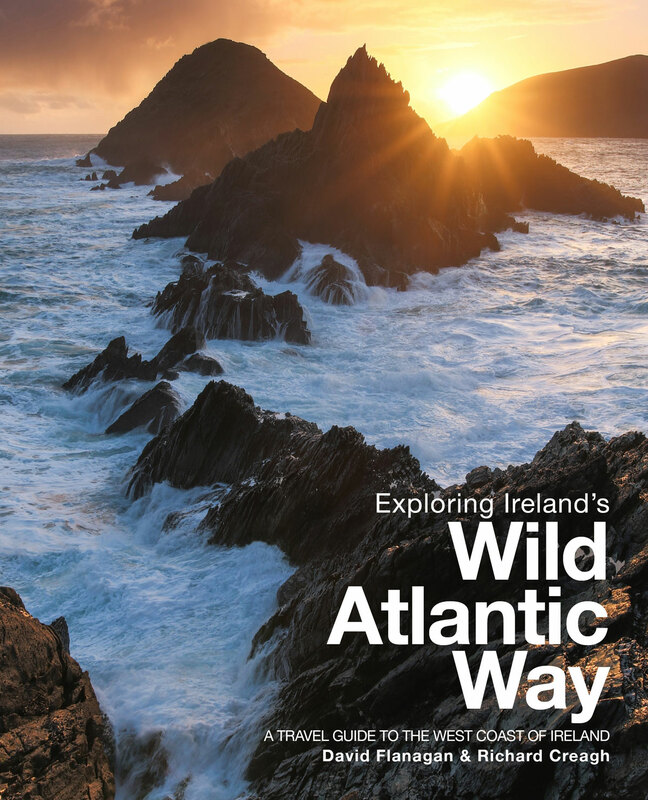 The Wild Atlantic Way stretches along the rugged west coast of Ireland for well over 1500km along the way it takes in vast sandy beaches, tiny coves and soaring headlands. 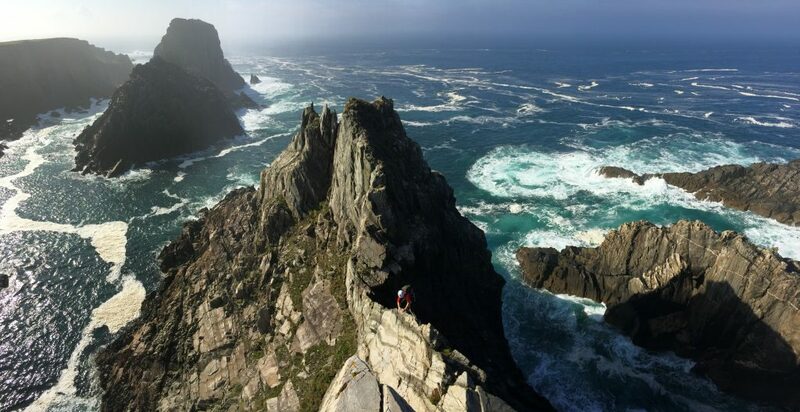 Unsurprisingly it is also home to some of Ireland’s best rock climbing. The cliffs which are pounded year round by the Atlantic offer a massive variety of climbing from short accessible climbs to some of the hardest and most committing routes in Europe. 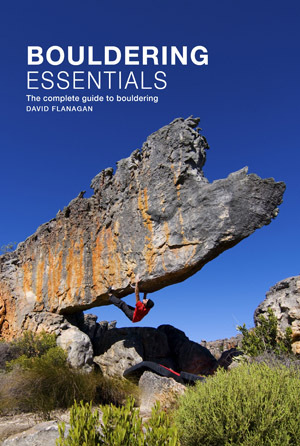 As the author of Rock Climbing in Ireland, a guide to the best of Irish rock climbing, and Bouldering in Ireland, the definitive guide to bouldering in Ireland, I have compiled this list of all the noteworthy climbing, both bouldering and routes, to be found along the west coast. The vast vast majority of roped climbing in Ireland is trad climbing, this is when the leaders places his own gear as they climb. There are only a handful of sport climbing areas in the country and they are quite small and scruffy. No one comes to Ireland to clip bolts! 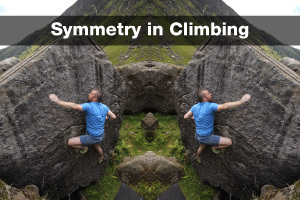 For more information about climbing in Ireland check out Rock Climbing in Ireland and Bouldering in Ireland. If you are looking for climbing partners or advice check out the forum on climbing.ie or the Irish Climbers Facebook group (the best option, plenty of traffic). Here is a list of some of the best rock climbing areas along the west coast from north to south. Rock Climbing in Ireland documents the best of Irish rock climbing. It details over 400 classic climbs spread across 22 crags in some of Ireland’s wildest, most beautiful coastal and mountain areas. With routes from Diff to E9 there is plenty for all climbers no matter what their ability and taste. Packed with extensive maps, precise topos, detailed route descriptions and inspiring action photos, this book is essential reading for anyone interested in Irish climbing. Buy it now for only €25.00 including postage worldwide. The vast county of Donegal has a huge amount of rock and is also extremely varied in terms of rock type. Rock Climbing in Donegal by Iain Miller covers the vast majority of the climbing, buy it from Mountaineering Ireland. Malin Head climbing. Photo by Bren Whelan of Donegal Climbing. 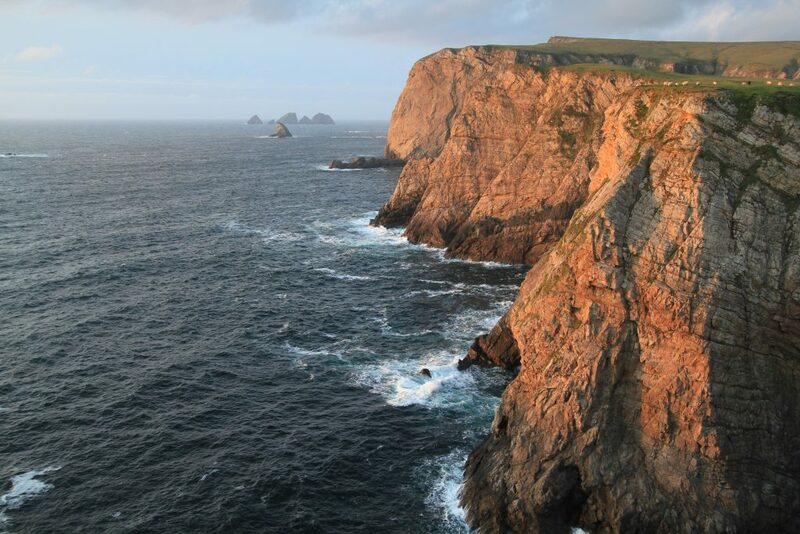 The most northerly point in Ireland is now also famous as a Star Wars location. The steep zawns are home to about two dozen routes with a mix of long single pitch and multi-pitch, mostly in the lower grades. Most routes require approach by abseil and the climbing has an adventurous feel. 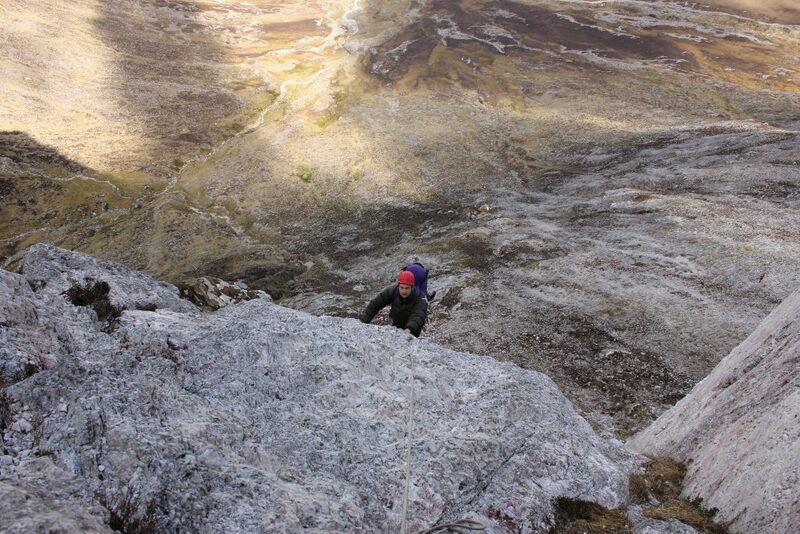 Bren Whelan of Donegal Climbing is a local guide who knows the place like the back of his hand. This small offshore island has over 200 single pitch routes on the granite sea cliffs and inland crags. The island is uninhabited and most climbers camp overnight near the beach. It’s an idyllic place with excellent climbing on rough orange granite. Access is by a short ferry journey from nearby Bunbeg. 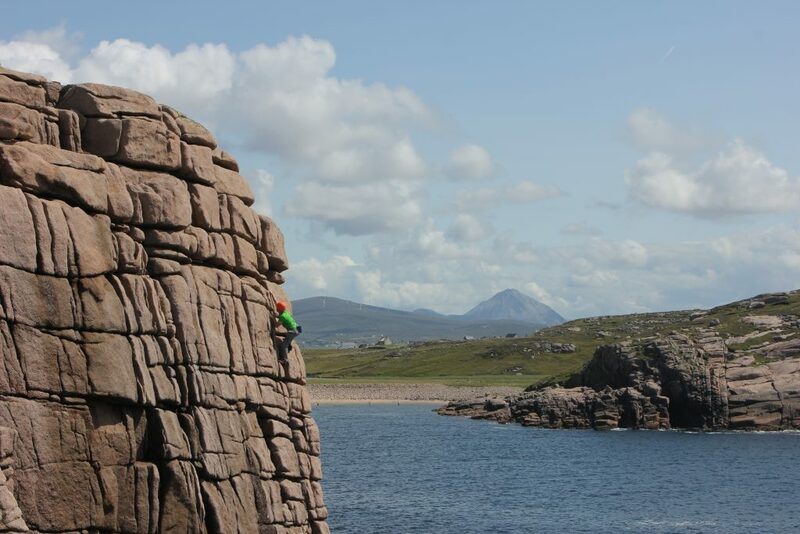 Cruit – pronounced critch – is connected to the mainland by a bridge and has over a dozen crags, it is probably the most popular climbing area in Donegal. 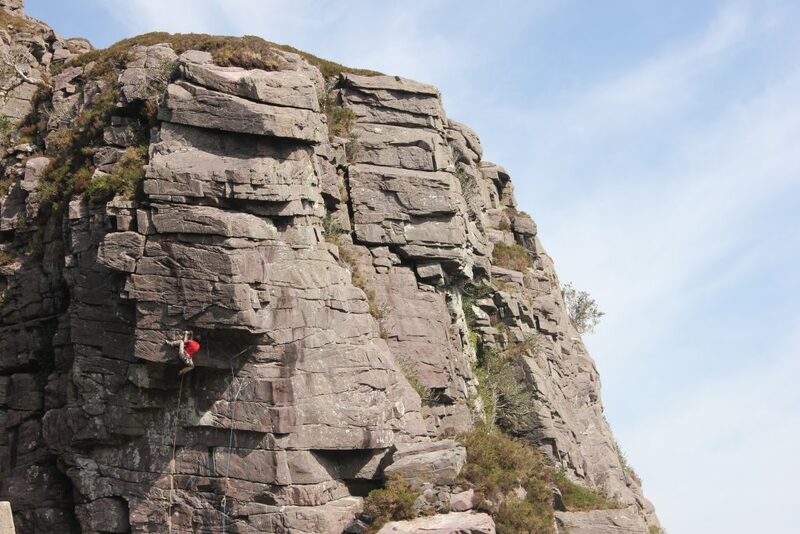 None of the crags are particularly tall but the access is easy as most routes don’t require an abseil and there is plenty to pick and choose from. The coast gets much drier weather than the nearby mountains and the rock dries quickly so it’s a good spot during inclement weather. Just off the tip of Cruit is Owey. The granite cliffs are much taller than Cruit and most require an abseil approach. Over the last few summers, a number of top quality hard routes have been established and Owey has become a popular destination for hard trad climbers looking for adventure. 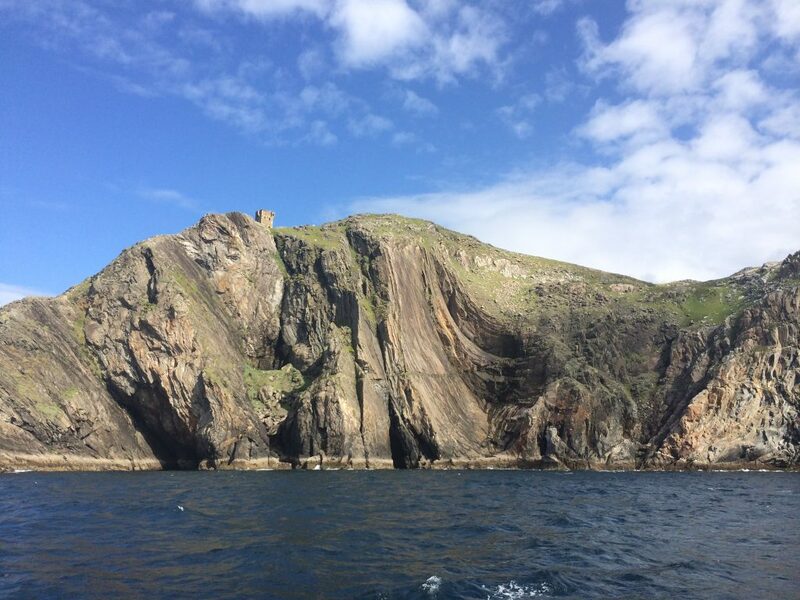 On the left is Cnoc na Mara, on the right is Tormore Island, Ireland’s tallest sea stack. At the end of the road to nowhere is An Port. The small beach near the western tip of Glencolmcille peninsula in southwest Donegal is the trailhead for over a dozen sea stacks. Some are relatively straightforward while others required the commitment of an alpine route. The classic stack is Cnoc na Mara – the hill of the sea – which, while only VS, is a serious route on loose rock and takes plenty of rope and nautical skills as well as lots of stamina for a long day. Guide Iain Miller of Unique Ascent is almost single-handedly responsible for the vast majority of the sea stack first ascents, there is no better man to get you to the top of a stack. This small compact area is west of the cliffs at Slieve League, not as popular as it once was, it offers short to medium length single pitch climbs. Some require an abseil approach, some are also affected by the tide. Sail Rock is concave slab on the right. 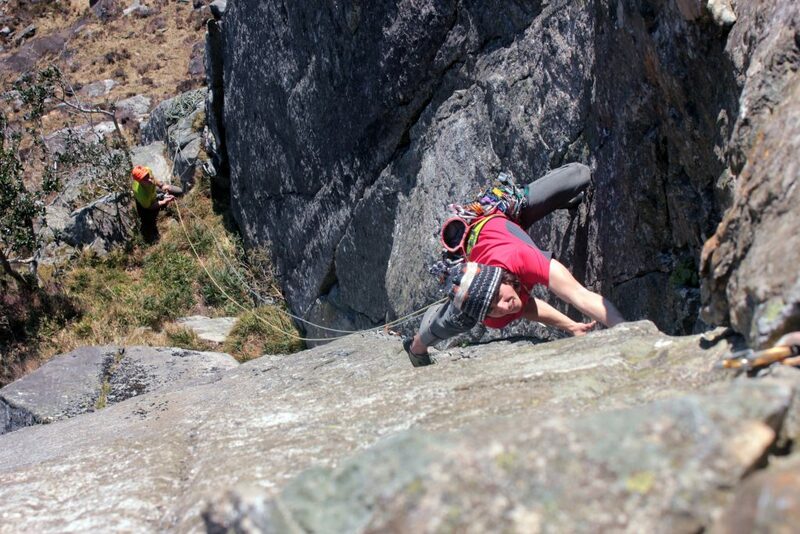 Photo by Bren Whelan of Donegal Climbing. One of the most impressive pieces of rock architecture along the west coast, from a climbing point of view at least. Sail Rock lies just east of the Slieve League viewing point at Bunglas. The base of the slab is accessed either by abseil or a very tricky scramble. The two standout routes are Main Mast E2 and Roaring Forties VS. The route on the left is taken by the classic E4 Stormy Petrel. Super steep climbing on lovely rough sandstone above a tidal platform. 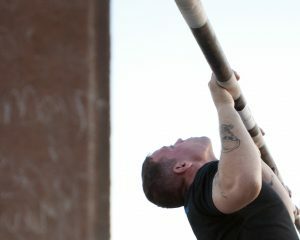 The climbing is very physical and athletic with plenty of gear if you can hang around to place it. Handy camping on the grass above the cliff. 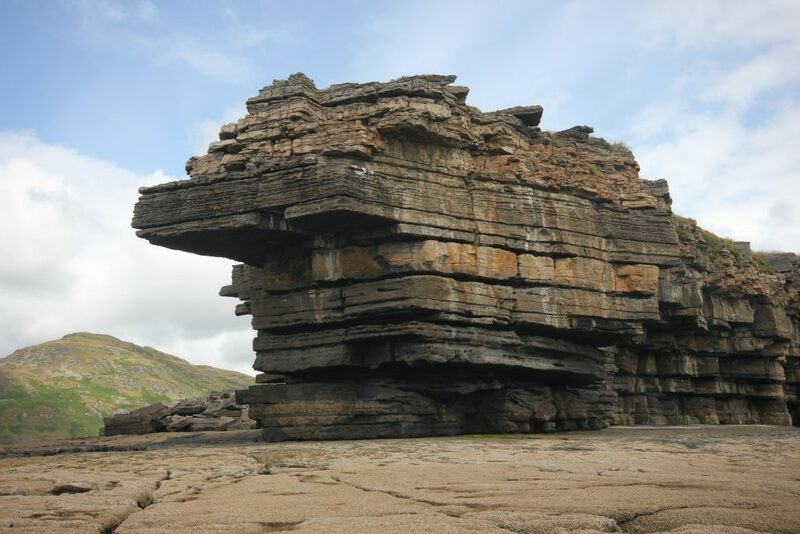 The Sligo coastline is pretty low lying in general however there is some very interesting , if condition dependent bouldering at Aughris Head, as well as some easy routes. The Mayo coast has a number of pretty minor areas, mostly short single pitch climbing but nothing of major interest. Benwee Head is the wall furthest from the camera. The huge cliff is home to only two routes, both 5 pitch E1s, the first of which was done in 2011. Not a major climbing venue but a good example of the kind of routes that are out there waiting to be climbed. Home to a good selection of quartzite sea cliffs, Achill isn’t a popular climbing destination but the rock looks pretty good so it might be worth checking out if you are in the area. 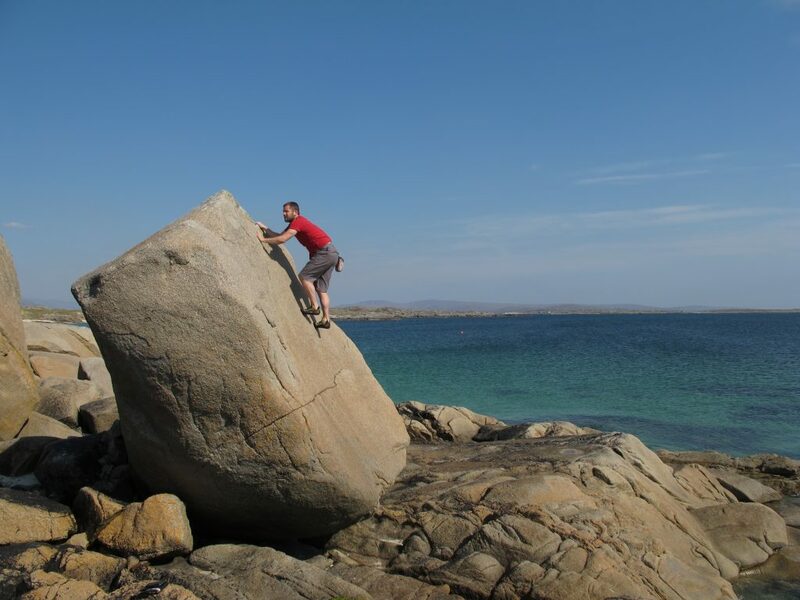 Granite bouldering near Dog’s Bay, Roundstone, Galway. There isn’t a huge amount of climbing along the Galway coast with the exception of some granite and grabbro route on Errisbeg near Roundstone and some bouldering on the coastline nearby. The Twelve Bens are a compact mountain range with a number of routes on the quartzite walls and even through a short distance inland there are worth a mention. The standout route is the very popular easy multi-pitch called Carrot Ridge. An undeveloped crag on Inishmore. Maybe over 50m height and 25m overhanging? A short distance off the Galway coast are the Aran Islands. All three islands are basically massive lumps of limestone yet only the largest, Inishmore, has much in the way of established climbing. The potential here is staggering, the south coast of the island consists of over 10km of continuous vertical cliff. What has been climbed so far is only the tip of the iceberg. 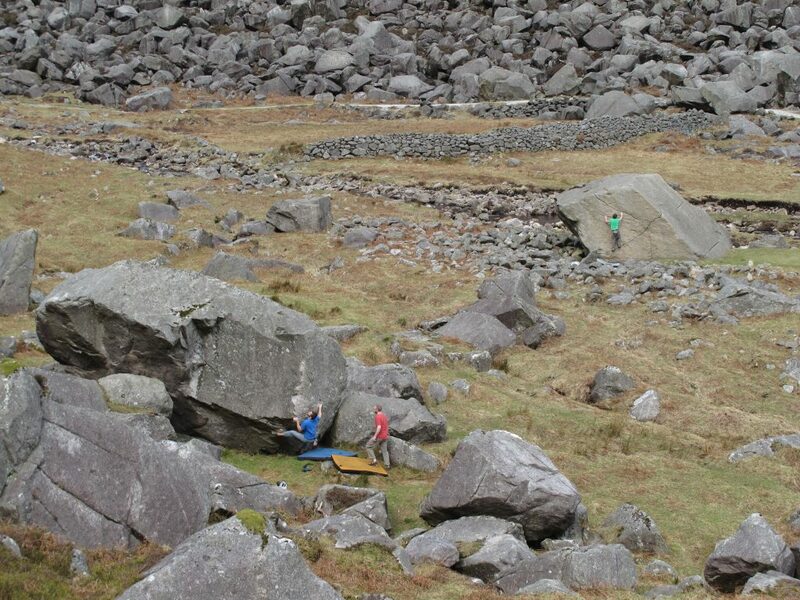 There is also some decent bouldering near Poll na bPiest aka the Wormhole. As you would expect given the amount of rock there are a number of other areas spread throughout the Burren however none match the quality nor quantity of Ailladie. 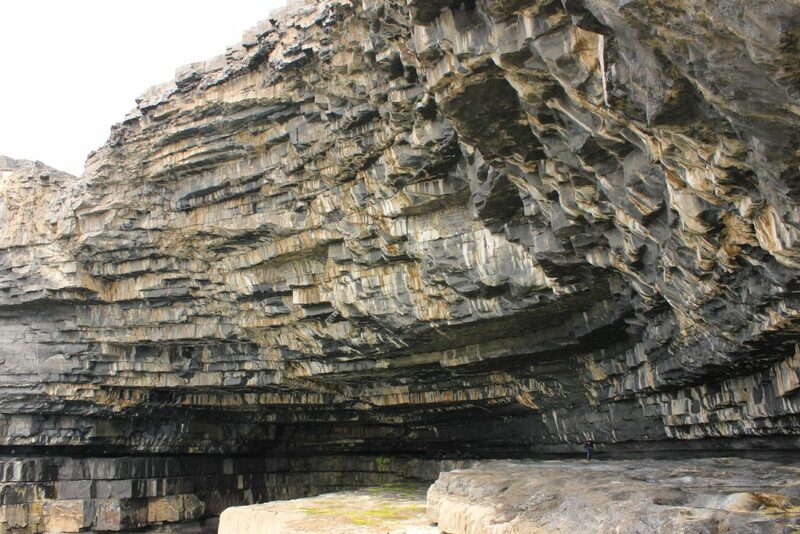 See the climbing.ie route database or the Burren guidebook for details. The 800m long stretch of limestone at Ailladie is considered one of the best sea cliffs in Ireland. In many places the sheer, predominantly vertical walls rise straight out of the Atlantic meaning that many routes require an abseil approach and a hanging belay. The best routes lie at E4 and above meaning this is a crag for the hard climber. There are easier routes that don’t require an abseil approach however they are of lesser quality. 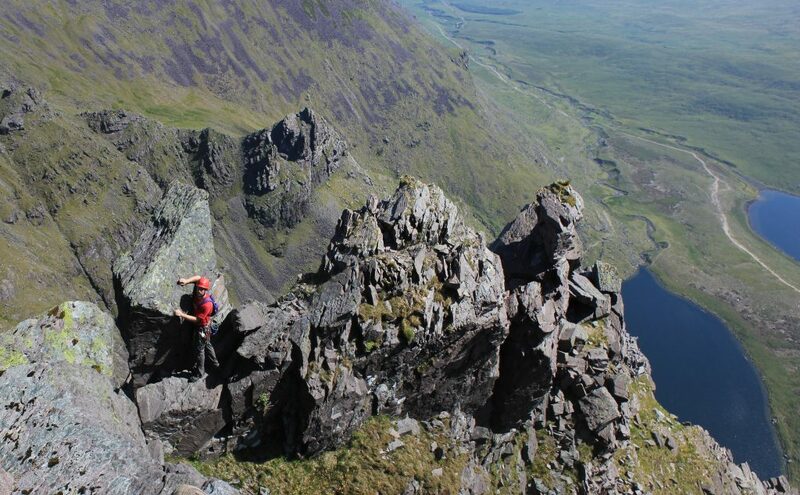 The mountains of Kerry are home to some of the best scrambling and hard hiking in the country. There are a number of long routes on the north face of Carrauntoohil, Ireland’s highest mountain. The easiest of which is the excellent Howling Ridge. Piaras Kelly of Kerry Climbing is the man to talk to if you are looking for a guide. Giraffe on the main face of Dún Séanna Head with the Needle in the background. 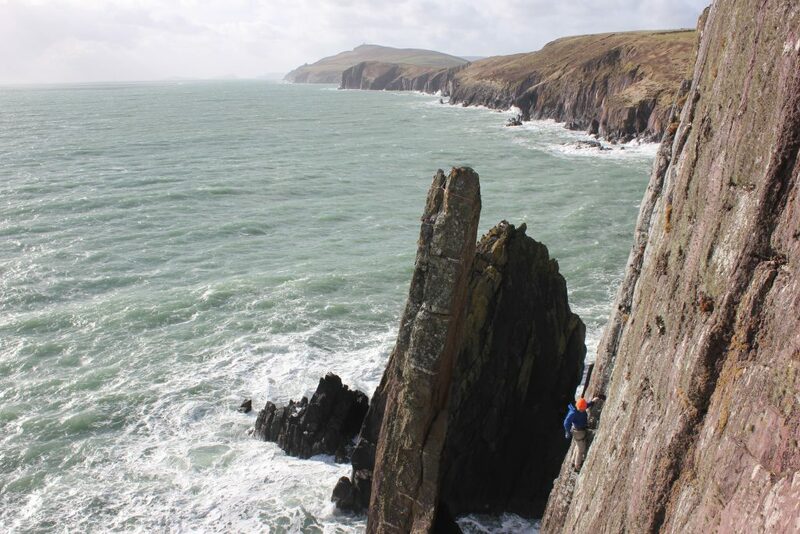 This small area just west of Dingle Town has a good concentration of long single pitch routes. The standout feature is the 20m tall Needle. 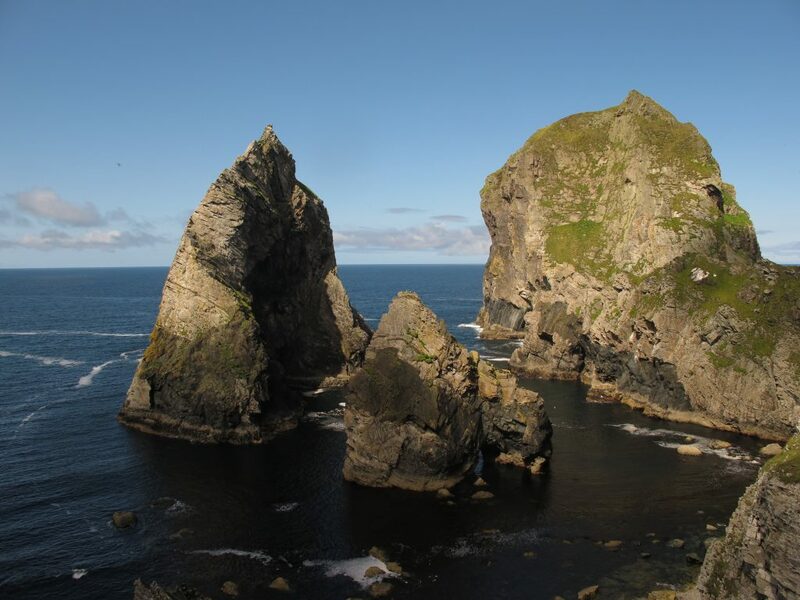 The easiest route to the top of the alarmingly thin sea stack is VS and a great adventure. Dave Ayton on Airtime in Poirse Gully in the Gap of Dunloe. The Gap of Dunloe is one of the most overlooked climbing areas in the country. The valley is home to about a dozen crags, of varying sizes and orientations. The rock is excellent coarse sandstone and the routes tend to follow distinct lines on good holds. 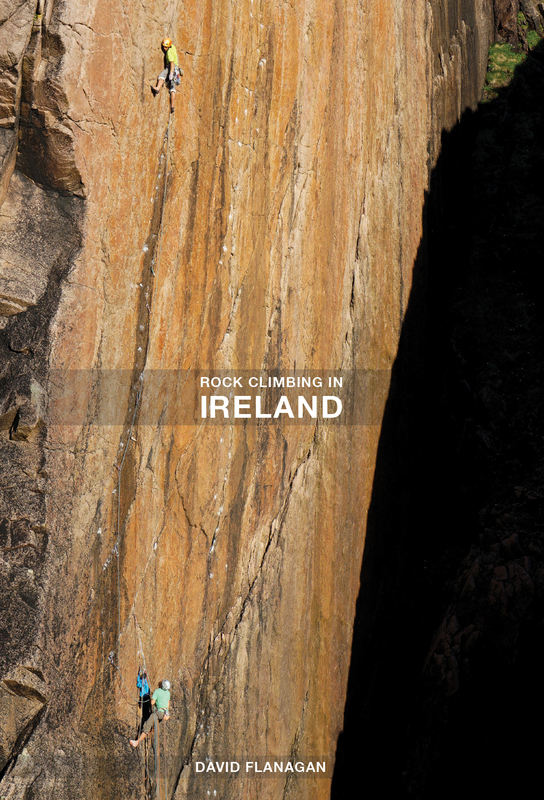 There is currently no print guidebook but Rock Climbing in Ireland gives a good overview. John Healy of Simply Mountains guides all over the country but knows the Gap very well. Cork has are over a dozen smaller areas that might be of interest to locals but there is certainly nothing worth travelling any distance to. 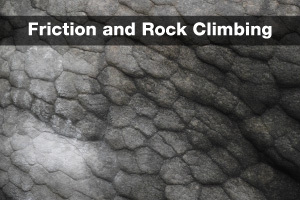 See the climbing.ie route database for details. 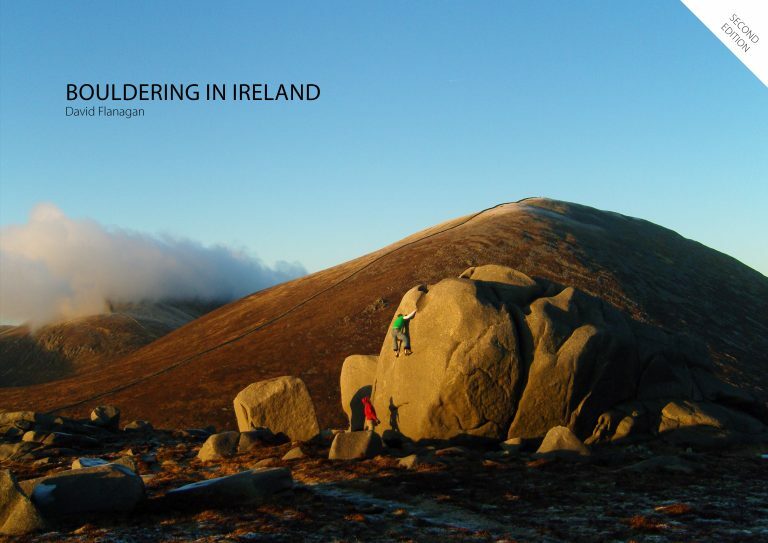 Bouldering in Ireland details every major and minor bouldering area across the length and breadth of the island of Ireland including Glendalough and The Wicklow Mountains, The Reeks, The Burren, Connemara, North West Donegal, Inishowen Peninsula, Fair Head, The Mournes and many more. Contains areas that have never been documented before. 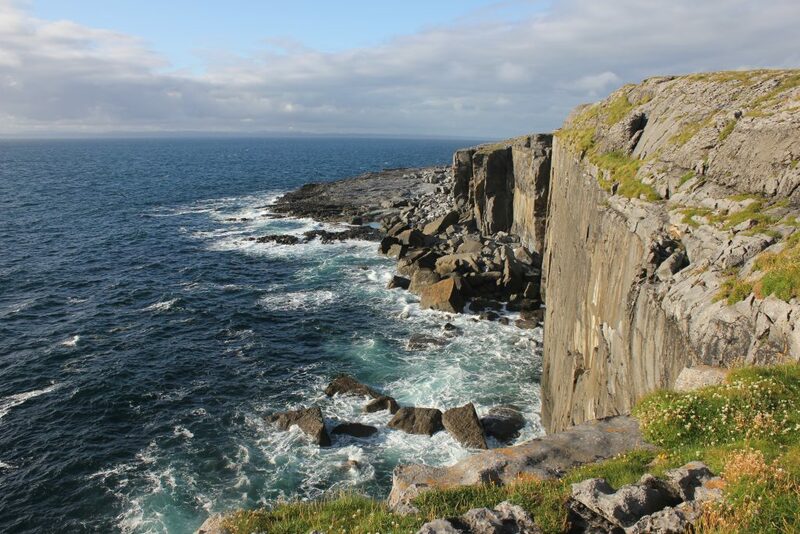 There is a lot more to Ireland than the Wild Atlantic Way indeed much of the best rock climbing is located on the other side of the country so if you are on a climbing trip it’s well worth moving around. The jewel in the crown of Irish climbing is Fair Head, near the Giant’s Causeway in Antrim. 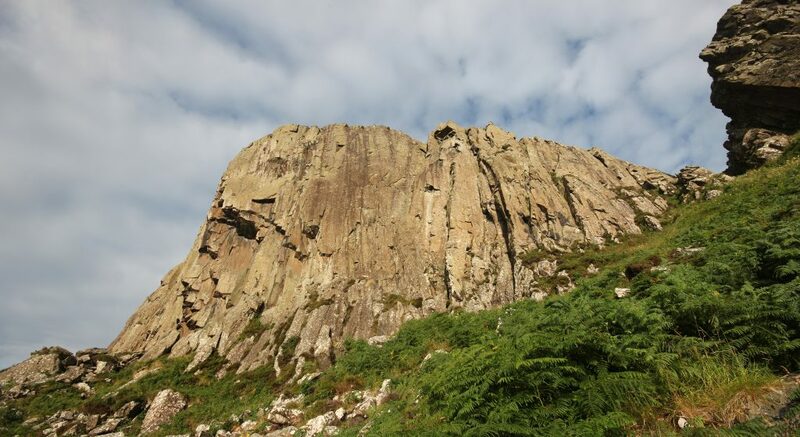 The dolerite cliff stretches for over 3km with over 400 routes and is considered one of the best crags in Britain or Ireland. 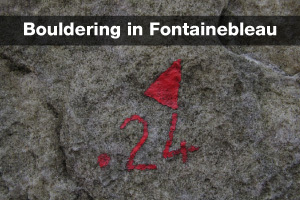 The climbing is predominantly on cracks and corners with some of the harder routes venturing onto the blank faces. 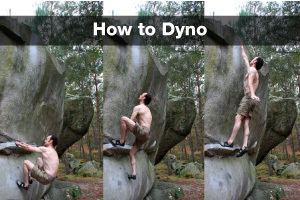 It’s not a crag for beginners with little below VS and many routes require abseil approaches. A little further south in Down is the Mourne Mountains. With over two dozen crags and a thousand routes, there is a huge variety of climbing, from short bold walls to long easy slabs. The granite is rough and the walk-ins tend to be long (an hour plus) but it’s an excellent area with a beautiful mountain setting. In the southern suburbs of Dublin is Dalkey Quarry. Excavated to build nearby Dun Laoghaire Harbour in the early 19th century, Irish climbers have a love hate relationship with it. Convenient and with a good density of routes yet a little scruffy and crowded. 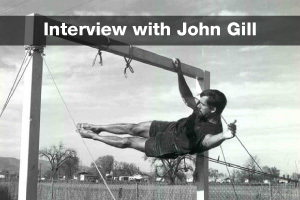 Either way, it’s a great resource to have over 300 route within the city limits and it’s where many climbers get their introduction to the sport. Kevin Kilroy on Sarcophagus, a classic HVS, in Glendalough. South again in Wicklow are two granite multi-pitch crags of note, Glendalough and Luggala. Glendalough is the more accessible of the two with plenty of easier single and multi-pitch climbs on clean, rough granite. Luggala is a larger crag with longer routes. The rock is a little more vegetated and harder to protect and it has a bit of reputation but there is a huge amount of excellent climbing to be had, a gem hidden in plain view. 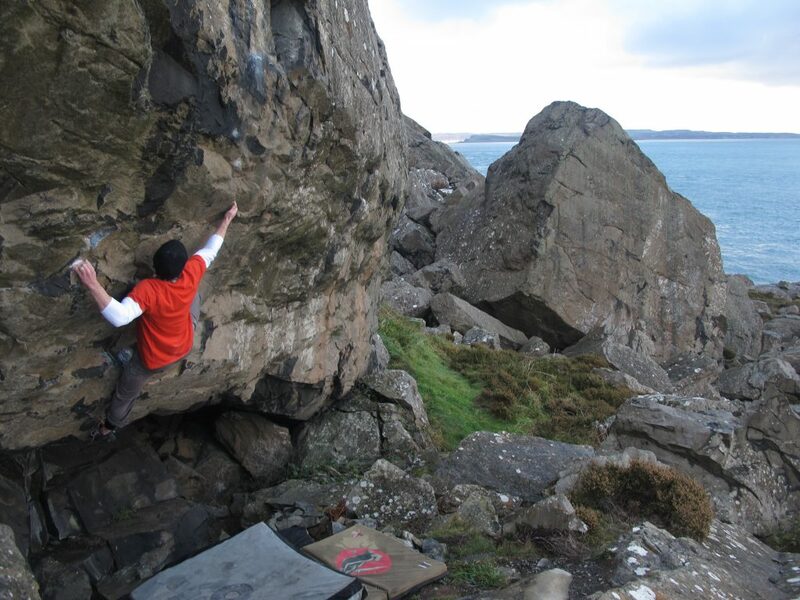 Paul Brennan on Boombastic in the Murlough Bay boulders, Fair Head. 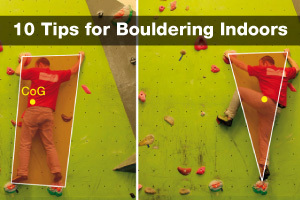 Two of the areas mentioned above have significant concentrations of bouldering, in fact between the two of them, they account for the majority of the bouldering in the country. Fair Head has literally miles of boulders jumbled along the slopes between the foot of the crag and the sea. 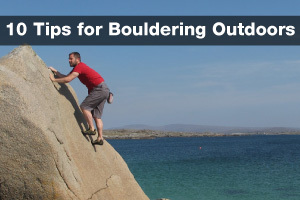 It’s an area for more experienced boulders as the landings in most cases are quite bad (the more pads the better), most problems are quite hard and it’s tricky around the boulders. Andy’s Arete on Big Jane in Glendalough. The second area is the Wicklow Mountains home to Glendalough which is probably the most popular bouldering area in the country. There are over a hundred problems on the fine-grained granite in a very accessible and scenic location. There are over a dozen other areas in the mountains, some are fairly extensive while others are more obscure but all are of the highest quality. The Wicklow guidebook is available from Mountaineering Ireland.